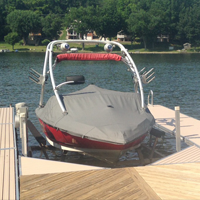 Metal Craft Docks offers a full line of boat dock accessories manufactured specifically to enhance the functionality of your dock system. Hardware for attaching items such as the 3-person bench, mooring cleats, and bumper brackets are designed to secure your accessories to the deck module without damaging the deck slats or side rail member. 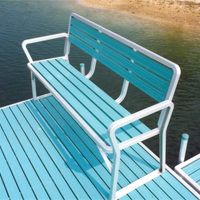 Our boat dock accessories also compliment existing wood, steel and some poly docks. Contact one of our authorized Dealers to purchase the accessories that best fit your needs or send us a request using the form below. A perfect complement to any dock system! Metal Craft Benches are designed to comfortably seat 3 adults and are available in system matching colors: Cloud White, Earth Sand and Sea Green. The bench fastens with a supplied hardware kit –no holes to drill! Metal Craft Benches can easily be moved, relocated, and can even be mounted on shore. Bench measures 62”L x 34”H x 19”D. The Swim and Safety Ladder is a must for avid swimmers. Premium quality aluminum pipe is formed into a pleasing curve making up the sides of the ladder. 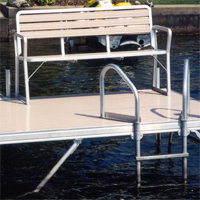 The Swim and Safety Ladder easily installs on either Metal Craft Docks or on a wood pier. Ladder measures 60”H with 4 steps set at 12” apart. Increase the usable space around your boat lift with Metal Craft Triangle Docks. Triangle Docks are manufactured of the same non-skid painted decking material as our standard deck modules; Choose from Cloud White, Earth Sand, Sea Green. Triangle Dock sections compliment “T”, “U”, “L” and “h” dock configurations. 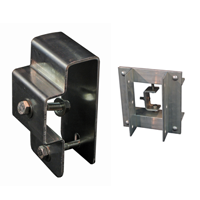 Metal Craft offers bumper brackets for end and side mounting. There are many different styles available depending on the type of Metal Craft Dock system you own. Please consult with your local authorized Dealer or view our product catalog to determine the bumper bracket best suited for your docks. We recommend the use of 2 brackets per 10’ length of dock. 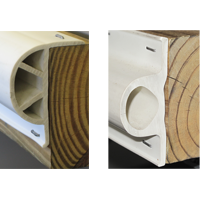 PVC Bumper Material is available in two profiles, angle back and flat back. 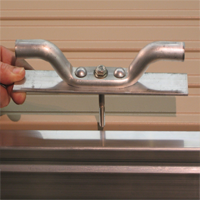 Marine dock bumpers protect your water craft and your dock. Mooring cleats are made of 100% aluminum and include hardware for attaching to a Metal Craft Dock without damaging the deck slats. Mooring cleats easily relocate as your needs change. Solar Dock Lites™ are a great way to illuminate your Metal Craft Stationary Docks. The dock lights attach to our standard 1-7/8”OD support pipe. 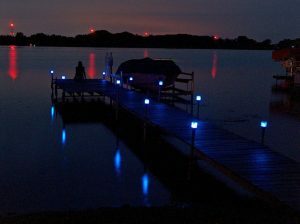 Solar Dock Lites™ are easy to install and provide auto dusk-to-dawn operation using super bright LED technology. Your dock is an expensive investment and we encourage you to protect it from unwanted boating collisions. The Solar Dock Lites™ package includes two solar powered lights, (4) AA rechargeable batteries, and white LED light bulbs. 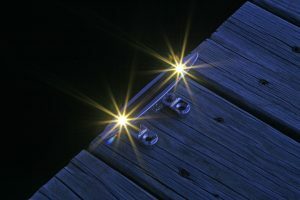 Solar Deck Lites™ are a great way to light up your Metal Craft deck modules making it easy for boaters to safely enter and exit water craft. 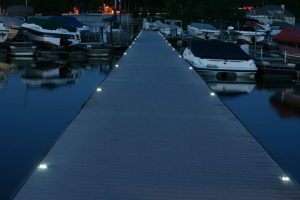 The low profile design provides ambient pathway and dock lighting. Built in reflectors provide extra safety for passing boaters and makes them ideal for marking swim platforms. Solar Deck Lites™ are made of anodized aluminum for superior protection in marine environments. The Solar Deck Lites™ package includes one solar powered light, (2) AAA rechargeable batteries, and a white LED light bulb. The 6″ solar cleat is a great way to provide mooring while illuminating your dock. Solar cleats make it easier to locate your dock and safer for boaters exiting the watercraft at night. The 6” Solar Cleat Lite™ is made from industrial chrome plated zinc alloy. Installs in minutes with screws or bolts (not provided). Two super bright LEDs and powerful solar panel provide 10-18 hours of illumination. The 6” Solar Cleat includes one solar powered cleat, (1) rechargeable battery, and a white 2 white LED Light bulbs.